Do you ever wonder if dogs are keeping all the secrets in the world between their soft, floppy ears? Snoopy makes us think that that must be true. He has a way of looking at the world through fresh puppy eyes. Take his doghouse, for instance, he spends more time lounging on top of it, contemplating day to day philosophy rather than huddled up inside! Any child can only hope to have as many imaginative adventures as Snoopy. The most well-known character was the World War One Flying Ace. He had his paws full chasing down the Red Baron and inspiring his ground crew when neighborhood kids weren't sneaking up and rudely interrupting him, that is. His imaginative adventures didn't stop there. He was an attorney that defended Peter Rabbit for his carrot theft convictions, a famous writer, and a cool college kid named Joe Cool. Even his humble imaginings were full of grandeur, he was what he called a "world famous grocery check-out clerk". We didn't even know that those existed! 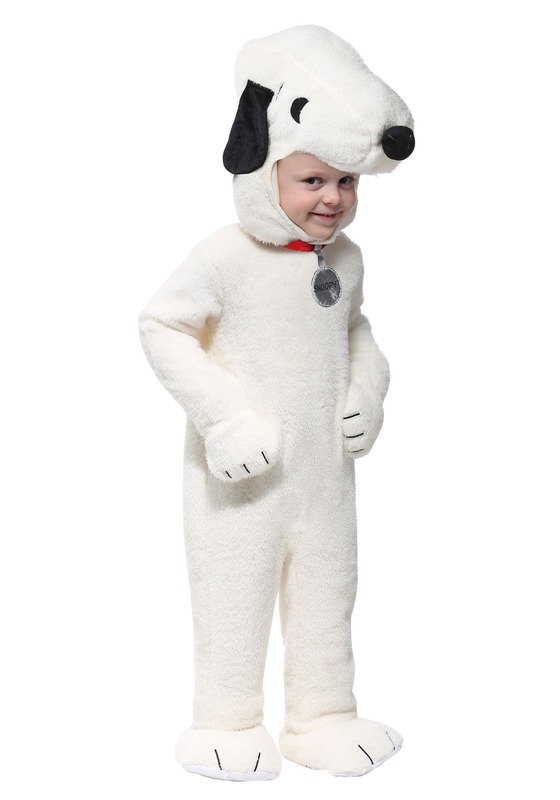 With all of these alter-egos, your child has plenty of choices for variation in this adorable Snoopy costume. This ensemble is perfect for finding and greeting the Great Pumpkin, after all, Halloween is one of Snoopy's favorite holidays! It's easy to transform with a black and white jumpsuit, a sculpted Snoopy headpiece that secures with hook-and-loop fastener, and a pair of slippers. So, now your kiddo better start practicing their Snoopy dance because the Great Pumpkin will rise out of the pumpkin patch he thinks is most sincere! I loved this costume! It was an absolute hit! I thought my little one would never wear the head piece, but she did. She loved the costume so much she insisted on wearing it to bed and had a meltdown when we made her take it off the next day. It’s very comfy. Note, instructions say not to wash or dry clean it.